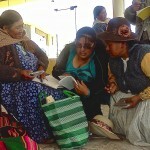 With papermakers of Chazuta, Peru, January 2015. Greetings! As summer turns to fall, I’m excited to shape “Movimiento…De la Cabeza a los Pies/ Movement…From Head to Toe” into its third installation. 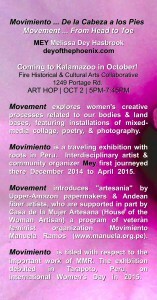 The exhibition shows in October at Fire Historical and Cultural Arts Collaborative, 1249 Portage St., Kalamazoo. 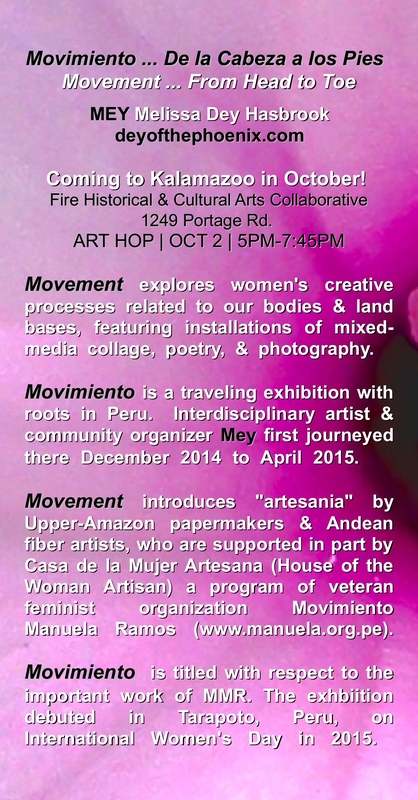 For those in the area, I would love to see you during Art Hop on Friday, October 2, from 5:00pm to 7:45pm! 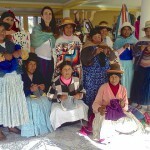 During October, I invite women to contribute their hands– artists, artisans, and practitioners! I continue to collect hand tracings since July’s show in Lansing. 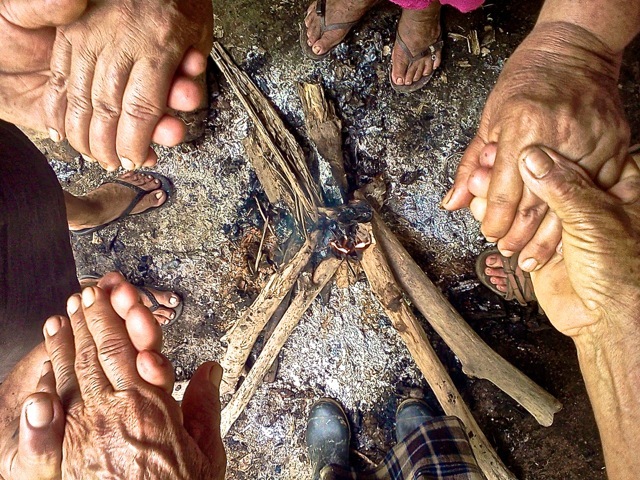 Your hands will travel with me to Peru for integration into the Cusco installation in 2016. I look forward to sharing more about this process as we enter the coming season. 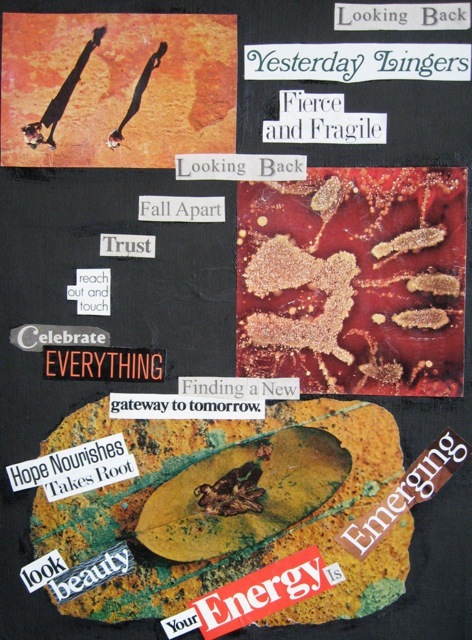 As always, I wish you much inspiration on your creative path and hope for healing! 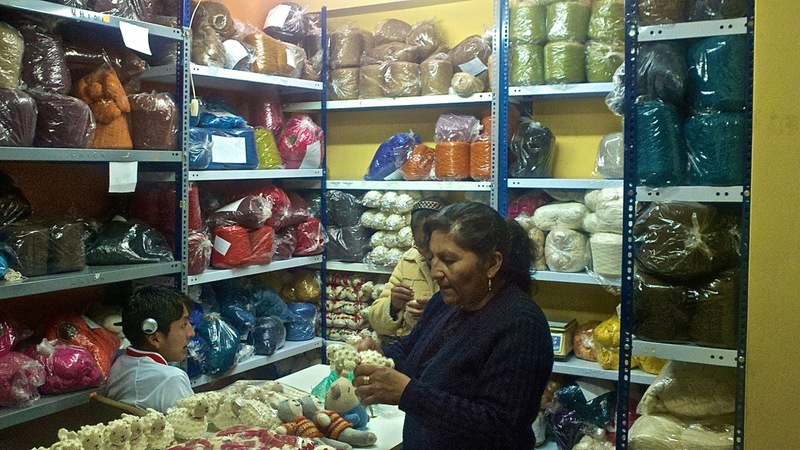 February 2015, Puno, Peru, at the offices of Movimiento Manuela Ramos — 40-year veteran feminist organization advocating women’s right in Peru, and home to Casa de la Mujer Artesana (House of the Woman Artisan). Quality control is taking place with inventory. RESCHEDULED! 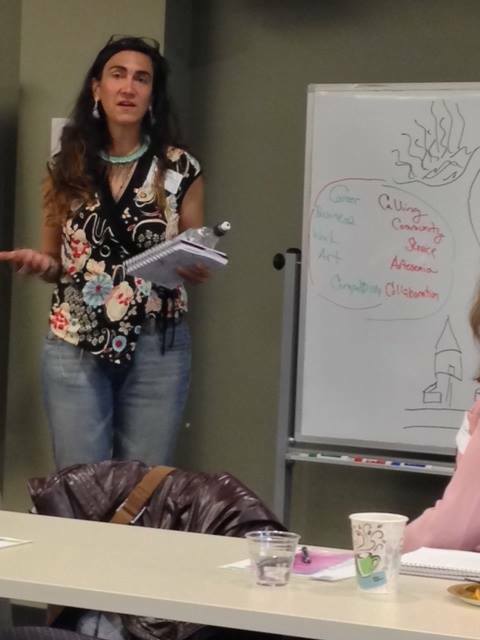 This Wednesday, July 29, 3:00pm to 4:30pm, a dialogue on creative industry for Greater Lansing takes place! (Due to a family health emergency, it was moved from last week.) Many thanks to all of the speakers who were able to reschedule for the same time on such short notice. 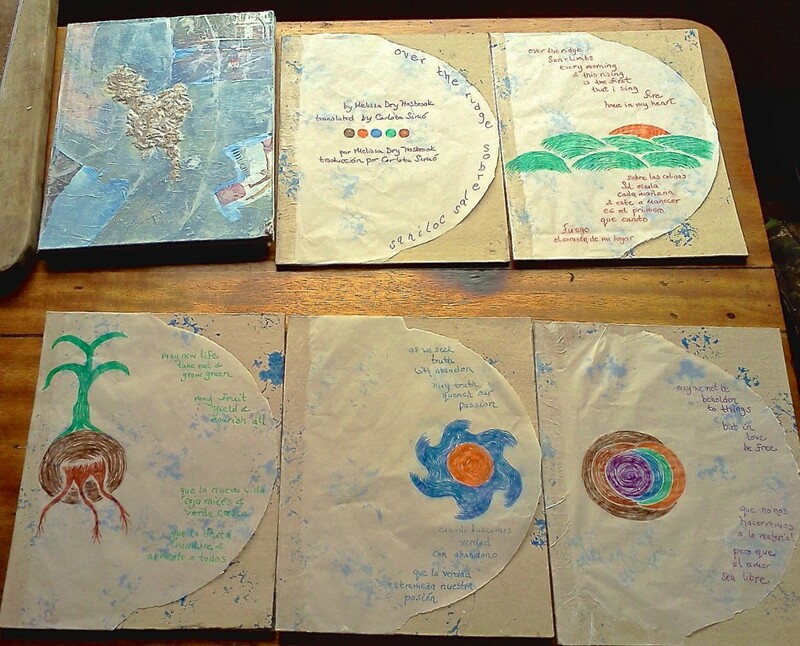 January 2015: Transforming poetry into book art during my artist residency in the Upper Amazon. 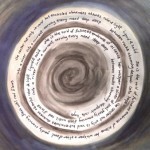 Poem “Over the Ridge”. 8 April 2015. Lansing, Michigan. Panel presentation on collaboration hosted by the Arts Council of Greater Lansing. Greetings from Peru! Yes, I still am close to the equator. It’s exciting to share my artistic debut in this part of the world. 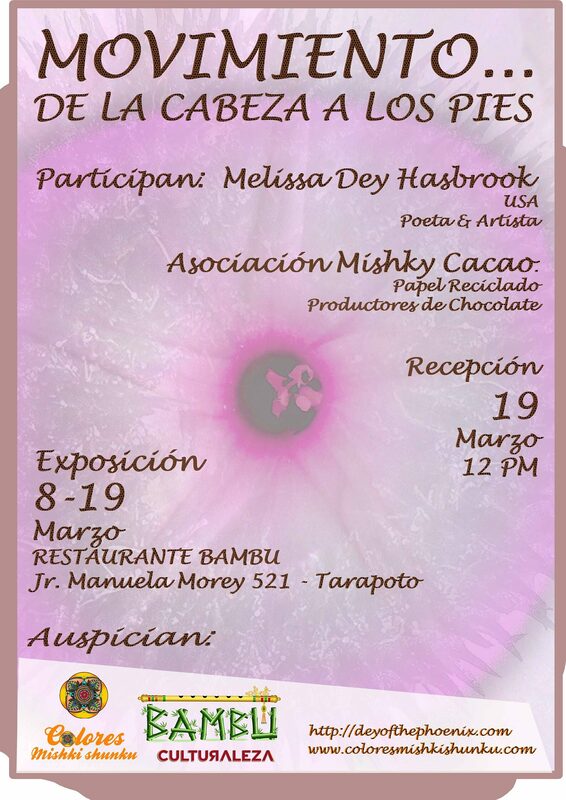 “Movimiento … De la Cabeza a los Pies” opened on March 8 — International Women’s Day — and is hosted by Colores Mishki Shunku at the restaurant and hostel Bambu (neighborhood Suchiche). 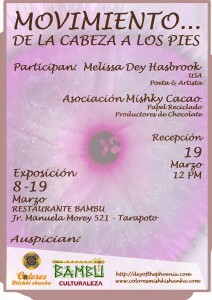 The reception concludes the show on March 19 at 12pm. In deciding to stay longer in Peru, I headed South again from the Upper Amazon in late February. Thanks to everyone at The Healing House of Cusco for an exceptional commitment of care for in-house and local residents. As I prepared for exhibition, I was so impressed by this community’s integration of creativity and spiritual practice that I plan to return in the coming year! Thanks to Jesu Guzman for the poster design.